We all love summers with its good weather and great sun light. However, one of the biggest nuisance in the summers are mosquitos that swarm our homes in hundreds. Using anti-bug vaporisers or mosquito zappers is not a practical solution considering every room needs one. 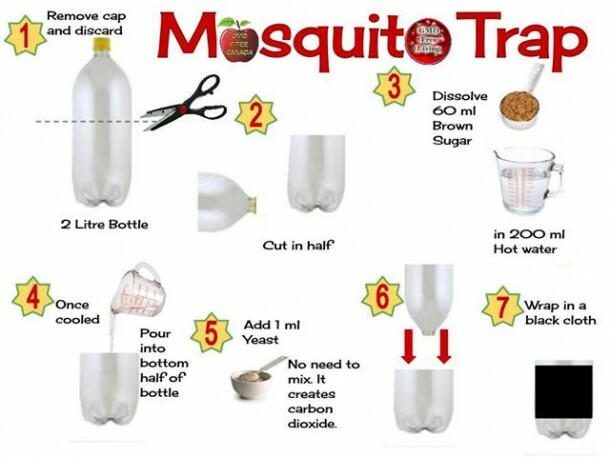 However, there is a very easy mosquito trap that you can make at home with household items. 1. A used 1.5 or 2 Ltr Coke Bottle. Wondering how this actually works? Well, mosquitos are attracted towards sources that generate carbon dioxide such as humans and animals. 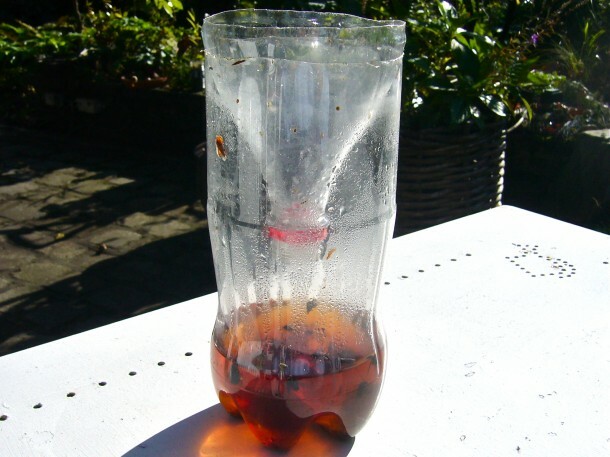 The above-mentioned solution of sugar and yeast will produce carbon dioxide at slow rate and the mosquitos will be drawn towards the bottle opening, ending up in water. So give it a shot and let us know in comments about how it worked for you. instead of wrapping the trap in black cloth, would spray painting the bottle black work just as well to disguise it? Tried it in our central Florida back yard, and again at my sisters house by the lake in Dallas, Tx. per the instructions. It does NOT work. It did attract some ants and a few gnat like flies. BTW carbon dioxide is slightly heavier than air, so it will settle down in the bottle and not be wafting out as if it were created by respiration. omg. does it work or not? Can u use regular cane sugar? Even DIY-ers wish to be taken seriously. After all, the concept, explanation and proven results would be more credible than just posting some pictures and instruction sheets. Also, there is no source or date as to when this (or any article on this site) was posted. You would get a LOT more readers if you followed good standards to posting information and providing results of the concept. 1. Who developed this idea? 3. When and how was it tested? 4. How many of these ‘traps’ must exist per given area? 5. Are there any risks? What if a child decides to ‘find a way’ to drink its contents (with or without the supposed drowned insects)? 6. How many mosquitoes on general are found in the trap on an average 12 hour period? 7. How many hours would the mixture be effective? 8. Explain the black cloth wrap – perhaps a burgundy/dark maroon or dark blue might have different results. 9. Who is the author of this DIY article? 10. How can we get in touch with the author of this article – or it’s source – for more information? 11. How much did the author test this before publishing it? 12. What region of the earth was this tested? Perhaps the Amazon, South America, or somewhere in North America? 13. What other methods were tried? 14. How effective did this method compare to other methods? Oh, I could go on, but this story lacks so much credible information, and this site seems to lack any source of information. I doubt I would want to advertise on this site. Though you (author or site owner) may not intent to treat your DIY readers like fools, it kind of comes off like that. At best, the author or site owner comes off acting like factual reporters at the expense and insult of the serious DIY-er. My request would be to republish this article that is factual and has the information to back it up. My request would be that you be bit by a thousand mosquitoes tonight. 1. It is fairly common knowledge that mosquitoes are attracted to sources of carbon dioxide, i.e. people and animals. When yeast consumes sugar it creates carbon dioxide as a byproduct. This contraption creates an excellent likeness to a live animal as far as those CO2-seeking pests are concerned. 2. The dark cloth wrap is also an attractant. It’s been proven that mosquitoes will bite individuals dressed in dark clothing far more often than those dressed in bright colors. 3. I’ve seen variations of this article all over the internet (seriously, Google it), many with photographic evidence of how well it works. One person posted pictures of their version created with a large mason jar. Within 48 hours it was two-thirds full of mosquito carcasses. I’m sure mileage may vary depending on location and time of year, but it works. 4. I would assume this is effective until the yeast consumes all of the sugar, at which point it will go dormant. Then it’s a simple matter of dumping the water and dead bugs and adding another batch of sugar water/yeast. And, if you can separate the dead bugs from it, you can scoop out and re-use the yeast in each subsequent batch! 5. Again, this type of contraption and its variations have been posted all over the internet. So, uh, good luck finding the original author. The thing is, considering how many of these guides you can find online or in books at your local library, I think we can be pretty sure it’s popular BECAUSE it works. No further fact-checking needed. 6. This article was shared by the site Admin. Says so right up at the top. I agree with other commenters. If you’re soooo interested in debunking this information – or even just finding out how accurate it is – GOOGLE IT. IT’S ALL OUT THERE. Jeez. Unless you’re going to post a “better” DIY article, please keep your inane and childish “observations” about this one to yourself. And next time, do a little research on your own before making yourself look like a tool. C-Bo obviously has too much time on his/her hands & limited common sense. Like your well said Zinger! Reading the comments, the amount of ignorance, and the complete lack of common sense, are scary. Getting bitten by a mosquito should be the least of some people’s worries. Don’t know what something is or how it works? Fair enough. But, in an age where “Google” is a verb — use it. I’ve read some comments. SMH. Anyway, this idea is one I’ll definitely be trying. Also, I’d like to know if you have a remedy for ants too. Thanks for posting. I understand the attraction concept but how are they killed? Mosquitoes breed in standing water. Does the yeast in the water also kill them? Yeast is not baking powder. Yeast is a form of baking powder!!! Yeast is a type of single-celled fungus – a living organism – that consumes sugars to propagate. A byproduct of this process is carbon dioxide. Baking powder is not alive, does not react with water and sugar in the way you are thinking (perhaps you’re thinking of its violent and brief reaction with vinegar? ), and bears absolutely no resemblance to yeast. Yeah, sorry to say this couldn’t be more wrong. Baking powder is tartaric acid and sodium bicarbonate. Yeast is Saccharomyces cerevisiae or a “sugar-eating fungus”. 2 questions. How far away from where the humans hang out should you put these? And how long will they last before needing to be replaced? I wish this will work. This is great and will try it. Thanks. @weston777: Tnx! This sounds like a great idea! The first time I found this topic, I also saw a suggestion, “How to remove ants from a house.” Now I’m not finding it. This is a bigger problem for me than the skeeters! Anybody? do the Kerosine oil spray in the area around u find Ants. sprinkle cornmeal on the ants. they will eat it and die. We tried lots of homemade solutions and purchased sprays for ants in the house. None of them lasted very long. I also tried the ant traps with dry powdered poison and no luck. I finally tried Terro Liquid. It attracts them like crazy and you’ll see a lot of them and then in two days they’re all sick and then they all die, including the queen in the nest. This is the only thing that ever worked. We have been ant-free for three years. Good luck! Please tell me yeast and sugar in grams. How long would one dosage last…. i.e. how often should it be renewed? We will certainly try it. If you add hops to the alcohol mix it’s heading towards beer. Yum? Mosquito flavoured beer! Yeast and brown sugar are available at any grocery store. Plain sugar will work, too. Will it work with normal sugar?? i can’t find brown sugar…..
A few indoor plants can produce the same effect, no?! Plants consume CO2 and expel Oxygen. So it’s basically the opposite effect. Although, there are a few plants that do well at repelling mosquitoes. Like the citronella plant. Is that what you meant, Waqar? Coffee grounds and a little water in a 1 gal glass jug leaning against a wall works great for water bugs and roaches in the yard. they can’t resist crawling up the wall and falling in the jug. Works so well I have to empty it every two or three days till the population is reduced to nothing. safe for all dogs and cats but check it daily it also catches lizards they are great for keeping the fly population down you don’t want them dying. What is Yeast? From can it be get? You can usually find yeast where the flour is sold in your grocery store. That’s where our grocery store has it.